From Morocco to the Middle East, people throughout North Africa and the Mediterranean love flame-licked, savory, full-flavored lamb. Although often overlooked by the typical American pallet, lamb adds a wonderful, subtly rich (not strong) flavor to your backyard cookout. Marinated in a wonderful spice blend rooted in a centuries-old traditions, this dish for you and your foodie-friend is best cooked over charcoal. 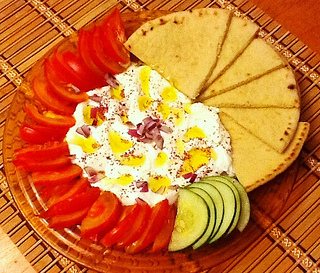 Serve with fresh tomato, lettuce, purple onion, and tzatziki/tanziki sauce on fresh pita. For slightly more adventure, have ground cumin and spicy harissa sauce on the table. 1. Make the Lamb Spice Blend Make the spice blend ahead of time for and store for convenience. Choose apx. 2/3 lbs. lamb loin for best results. Select pieces from lamb shank steaks are a good alternative. Trim fat to about 1/8″ and cut into uniform pieces for kabobs, apx. 1 1/4 inches. Add lamb & marinade to non-reactive bowl, thoroughly mix, marinate 4-6 hours in refrigerator. 4. Prepare Kebobs Thread lamb on skewers leaving slight space between pieces. 5. Direct Grill over charcoal on oiled grates and monitor; turn frequently to cook all sides evenly. When cooked to preference, sprinkle lightly with cumin and salt. 6. Serve with tzatziki /tanziki sauce, purple onion, lettuce, tomato on pita. Garnish with harissa sauce. This entry was posted in Lamb, Mediterranean, Recipes and tagged BBQ, cardamom, charcoal, cookout, cumin, food, garlic, kebab, kebob, lamb, marinade, meat, Mediterannean, mint, oregano, pepper, rosemary, thyme. Bookmark the permalink. The kebabs are fantastic on pita bread. No pardon is necessary. Glad you like it and I’m looking forward to reading your post!